...but it will be online. I couple of years ago I fiddled around with the Firefox web browser but didn't find it to be all that grand compared to Internet Explorer. Since then a whole bunch of people have been telling me that it is the greatest, that it is infinitely superior to IE, that I really need to install it and run it, etc, etc. For whatever reason (laziness or apathy, pick one) I never did it. Until today. "Why today?" you say. Why else? Because a pretty girl asked me to, of course. I have to say, the latest version of Firefox is all that it proponents say that it is. Way, way, way better than Internet Explorer. The tabbed browsing feature alone makes it worth taking 3 minutes to download and install it. Add to this the fact that you are way less likely to get hit with a virus/spyware from browsing with it, and you are on your way. So I'm on board - now I am the guy telling you how much better your life will be by shaking your fist at Bill Gates and joining the web browsing revolution. 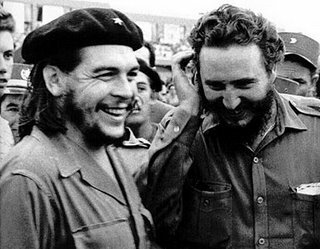 Che: "Dude, Fidel, you HAVE to try Firefox. It is so much better for the people than IE6"
Download & Install Firefox here. Do it now. I have this repeating vision of "Kanu Wolf Boy" running in my head. The name Kanu seems appropriate for a wolf boy with superhuman powers. Did you ever see the show "Lucan"? The guy was raised by wolves and his eyes turned orange when he got angry. He also growled like Chaka when he went into wolf mode. To get back on the subject, I have become an advocate of opensource. I'm doing some LAMP stuff on the side and it just amazes that this development framework is free. I tried to get my company to seriously consider SugarCRM (written in PHP using MySQL) for our CRM package. It's free, and you get the code, so you can customize it. (My company chose to spend 25K on Microsoft CRM. Why...?) Go to sugarCRM.com when you get a chance. It's great for support call management as well. You might find use for it. A friend of mine is using it for support calls at his startup company. As far as the wolf-boy thing goes, I have no idea what the hell you are talking about. Sounds like the crazy, incoherent rantings of someone who drinks some peyote, cranks up "Sounds Of The Sitar" in his cube, and wites SQL code all day in an enlightened state. I must say that you are the most technically versed mouthbreather I have ever come across.